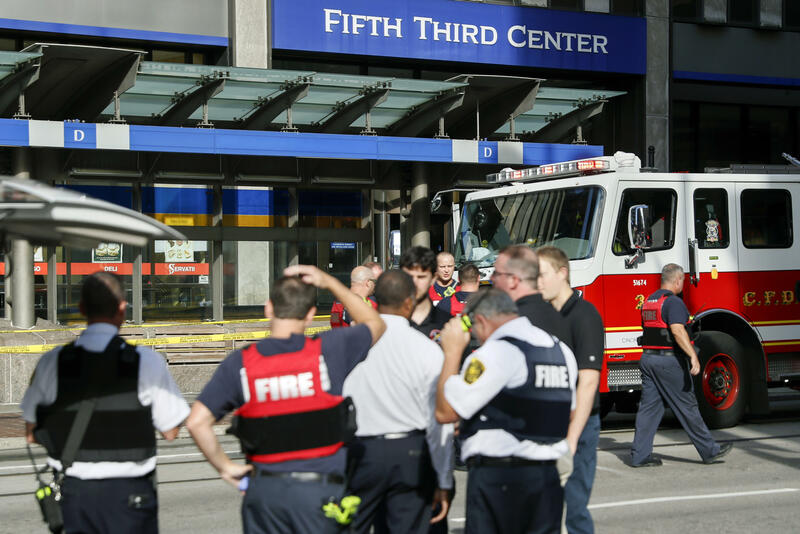 CINCINNATI -- A gunman opened fire Thursday morning in a building in the heart of Cincinnati in an attack that left him and three other people dead, police said. The shooting sent people scrambling across the city's Fountain Square amid cries of "shooter!" "Our officers responded very quickly," Isaac said. "They engaged the threat, and they neutralized that threat; however, there was some tragedies that did occur ... You know, these are things that we see happening across the country, and we all have to be vigilant and prepared to deal with these situations." The gunman was identified by police as Omar Enrique Santa Perez, 29. Fifth Third Bancorp said he was not a current or past employee, according to police Lt. Steve Saunders. He said police don't know yet why the gunman went to the building. Saunders said more information was expected to be released Friday. Hamilton County prosecutors said the gunman was armed with a 9 mm gun and had no known local criminal record. Police later swarmed an apartment in North Bend, Ohio, a village some 15 miles west of Cincinnati. They didn't immediately explain the search. Federal and state agents were on the scene as police searched through the building. Michael Richardson, who works in the building, told The Cincinnati Enquirer that he was standing outside the entrance when he heard gunshots in the lobby. "I looked behind me and saw the guy -- he shot and then he shot again. After that I started running." A woman who works with her had taken the elevator down to get a drink. When the elevator doors opened, Hanson said her co-worker almost stepped on a man's body. She got back in the elevator and rode up to her floor, where Hanson said she was in complete shock and unable to form complete sentences. "Then we knew what was going on," Hanson said. Jaenetta Cook, who manages Servatii Bakery on the building's first floor, said she hurried to lock the door after the first two shots were fired. Then, she heard more that "sounded as if they were getting closer and closer." Cook said she and two other employees hid in the bathroom for the duration of the shooting. "I made it out to see my kids, to see another day," she said in relief. One of the victims died at the scene. Two more died at University of Cincinnati Medical Center. UC Health spokeswoman Kelly Martin said one victim remained there in critical condition. The hospital said on Twitter that another was upgraded to fair. All four taken to the hospital had gunshot wounds, Martin said. "It could have been any one of us," Cranley said. He praised "the heroism" of police who ended the threat within seconds and the response of other emergency personnel. "It could have been much, much worse," Cranley said. Witnesses described a chaotic scene, with people running away in fear and confusion while hearing gunshots. Leonard Cain told the Enquirer he was going inside the bank when someone alerted him there was shooting. He said a woman, who was wearing headphones, didn't hear the warnings and walked into the bank and was shot.